Yesterday afternoon I went to a panel discussion at Queen Mary University of London on African witchcraft. It was a brilliant event and I'm going to be blogging about it at length - but not today because writing it up will take some time. Instead I am sharing a view of Regent's Canal, which runs alongside the university. I arrived at the East London campus with some time to spare and the bus stop I alighted at was called Regent's Canal I thought I'd go and explore the waterway before heading to the lecture room. It was a lovely place for a springtime stroll and I took this photo when I was there. 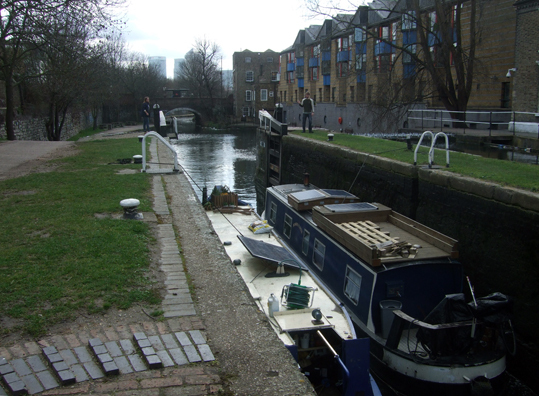 Regent's Canal winds through North London from Little Venice to Limehouse in East London, where it joins the Thames. Although it was originally a busy 19th century route for transporting cargo, these days it is a quiet and peaceful place to get away from the noise and crowds of the city.